NGP Sonic the Hedgehog Pocket Adventure in 13:19.76 by Memory. Sonic the Hedgehog Pocket Adventure is a platform game developed and published by SNK and released for the Neo Geo Pocket Color in 1999. 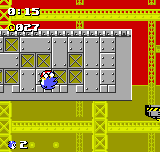 The game is heavily based on Sonic the Hedgehog 2, borrowing much of the stage themes and gameplay elements, but featuring unique stage layouts, elements from other Genesis Sonic the Hedgehog games, and extra game modes. In this run, Memory beats the game using precise jumps and glitches to complete every level as fast as possible.